The goal of Federal Oil Pollution Prevention regulation in 40 CFR Part 112 is to prevent oil discharges from reaching navigable waters of the United States or adjoining shorelines. As a cornerstone of EPA’s strategy to prevent oil spills from reaching our nation’s waters, the EPA requires that certain facilities develop and implement oil spill prevention, control, and countermeasure, or SPCC Plans. Unlike oil spill contingency plans that typically address spill cleanup measures after a spill has occurred, SPCC Plans ensure that facilities put in place containment and other countermeasures that would prevent an oil spill from reaching shorelines or navigable waters of the U.S. A spill contingency plan is required as part of the SPCC Plan if a facility is unable to provide secondary containment (e.g., berms surrounding the oil storage container). In 1989, the California Legislature found that in order to protect the state’s people and natural resources from aboveground petroleum storage tank spills, an inspection program was necessary. 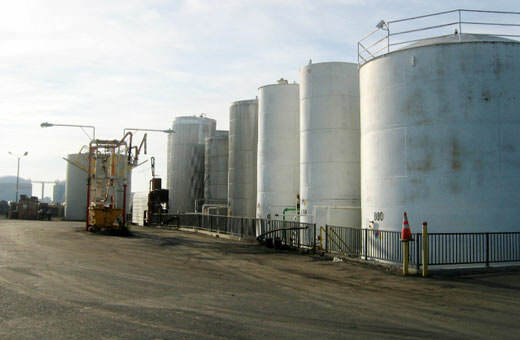 The Aboveground Petroleum Storage Act (Act) became effective January 1, 1990. In general, the Act requires owners or operators of aboveground petroleum storage tanks to file a storage statement, pay a fee, and prepare and implement a federal SPCC plan. The Act is now implemented by local Certified Unified Program Agencies (CUPAs) in California. Who is subject to the law, and who is exempt? The SPCC rule applies to owners or operators of facilities that store, use, process, refine, transfer, distribute, or consume oil and oil products. The federal regulations have three basic criteria before a facility is subject to the rule: (1) it must be non-transportation related; (2) it must have an aggregate aboveground storage capacity of 1,320 gallons or a completely buried storage capacity of 42,000 gallons; and (3) there must be a reasonable expectation of a discharge into or upon navigable water of the United States. The California State Water Resources Control Board (SWRCB) has limited the exception identified as item 3 in the preceding sentence by issuing the opinion that all aboveground petroleum tanks in California have a reasonable probability of discharging into navigable waters of the State. The Act and the SWRCB opinion noted in the preceding paragraph apply only to petroleum. Oil is defined by the Federal rule to include: petroleum; fuel oil; sludge; oil refuse; fats, oils or greases of animal, fish, or marine mammal; vegetable oils including oils from seeds, nuts, fruits, or kernels; synthetic oils; and mineral oils. A rule of thumb offered by EPA: If the material can cause a sheen, sludge or emulsion in or on surface waters, then it is likely an oil or has oil properties. On November 5, 2009, US EPA adopted revisions to the SPCC rule. The revised rule reduces the number of facilities regulated and changes some requirements. EPA published a final rule amending the SPCC Rule in the Federal Register on November 5, 2009. The finalized amendments to the SPCC rule became effective on January 14, 2010. The U.S. EPA provides information regarding the finalized amendments on their website www.epa.gov/emergencies/content/spcc/spcc_nov09amend.htm. Condor engineering staff, including Registered Professional Engineers, can review and certify your self-developed plan, develop a SPCC Plan, or can update your plan to meet the new requirements.